The number of pictures is different, and is depending on the resolution and size of your display or screen. To move a picture you simply use the drag & drop funtion of your browser, just click on a picture, hold the mousebutton down and move the pic to another position. Release the button, if you believe you have found the correct position. If two techniques / pictures are all the same, they can be swapped. 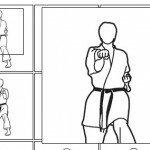 Typical example is the start and end technique of the most kata. If it is easy, everyone is able to solve it 🙂 Sometimes you have to compare two pictures in detail to see the differences (use the zoom function). Sometimes you will see only the back, then you have to consider, which arm must be at hikite or which leg is in the air. Is the hip in correct position? Is the stance the right one? In case of doubt press the „resign – solve it automaticly“ button or take a look into the kata books of Fiore Tartaglia Volume 1 / Volume 2.